Back in 1990, when Kevin Costner's hugely successful directorial debut Dances with Wolves swept the Oscars, it marked the first time in decades that the Western had been taken seriously (in the years following we would see Unforgiven and Open Range). Costner's adaptation of Michael Blake's novel, about disillusioned Civil War officer John Dunbar who is accepted into a Sioux tribe on the American frontier, was the subject of much derision prior to release; the detractors were quickly silenced when it rode away with 7 Oscars. The film was an enormous commercial and artistic success, grossing over $400 million worldwide, featuring a careful performance from the director himself in the lead, a firm commitment to filming as much as possible in authentic dialect and jaw dropping cinematography from Dean Semler. Costner's desire to flesh out the Sioux characters, who in previous years would have been neglected in the backdrop, works brilliantly, and there is strong support from Graham Greene and Mary McDonnell (respectively, as shaman Kicking Bird and Dunbar's eventual love, Stands With a Fist). With Dunbar every step of the way is a magnificent, Oscar-winning comeback score from John Barry, who had been laid off some years previously due to oesophageal surgery. It was Barry's last hurrah; in opposition to the resurrection of an old genre as seen in the film, Barry delivered possibly his final masterpiece, a wonder of at least half a dozen themes, stand-alone moments of immense beauty (for which he is of course known), thrilling action and sombre reflection. In the grandest sense of the best film scores, the album takes the listener on a journey, starting with the melancholy snare drum/choral opening, "Looks Like a Suicide", as Dunbar attempts to take his own life. We are also introduced to the lovely main theme; a somewhat straightforward trumpet-led melody that, though beautiful and justly heralded, must be less impressive when compared with the score's other achievements. Its stand alone recognition on the string section in track four (of the expanded album) however is breathtakingly gorgeous: sad, lonely, hopeful and reflective. It even gets a laid back harmonica rendition later on, adding to the texture and authenticity of the score. Chief among the incidental sections is the heavenly rising string work in "Journey to Fort Sedgewick" (when coupled with Semler's awesome lensing of the Dakota vistas, it's hard to imagine a better marriage of image and music); the rousing homage to westerns of old in "The Buffalo Hunt"; and the sinister, bass heavy theme for the violent Pawnee faction ("The Death of Timmons") who become increasingly prominent as the film goes on. Yet it's the careful interweaving of these moments that defy the critics claiming Barry is guilty of reinstating themes ad infinitum. Wolves is the ultimate rebuttal: never a moment goes by when he isn't introducing something new or reshaping a previous theme. It's an interesting contrast to his Oscar winning Out of Africa, a slimmer, yet perhaps more emotionally direct score consisting primarily of two themes. Here the listener is almost overwhelmed with treasures. "Two Socks/The Wolf Theme" is one of the score's most delightful, a gossamer light wind piece capturing the delicacy and beauty of the frontier's lupine symbol. "The Buffalo Robe" introduces an air of nobility for the Kicking Bird character, and his integral relationship with Dunbar, while the material for the buffalo themselves ("Spotting the Herd"), tonally, cleverly skews close to the above, a basic two note horn structure linking the Sioux with the animals central to their way of life. Barry is also able to contort white man Dunbar's theme into something truly anguished in "Journey to the Buffalo Killing Ground", suggesting the desire for destruction and violence in the settlers invading the Sioux lands. The final and perhaps most beautiful principal idea to be introduced is the heartbreakingly romantic "Love Theme", something that starts tentatively before burgeoning into full-blown amour as Dunbar and Stands With a Fist get married. All of the above is developed, heightened and bettered as the score proceeds, painting a terrific, nostalgic view of a lost way of life. But of course the sense of sadness becomes increasingly pervasive towards the climax as the tragic (real-life) events come to deny the Sioux their heritage and freedom. "The Death of Cisco", as Dunbar's horse is cut down by his former allies, is an intensely sad piece, before "Rescue of Dances With Wolves"/"The Return to Winter Camp" briefly restores a note of heroism and hope as Dunbar is rescued by his tribe and reunited with his wife. The love theme gets a particularly glorious rendition in the latter. Yet, of course it can't last and, as Wolves and Stands With a Fist go "to talk with those that would listen", so Barry wraps up his multitude of themes in a magnificent 9 minute "Farewell/End Title", encompassing every conceivable emotion, all undershot with the tragic, inevitable sense of melancholy as the Sioux people pass into history. 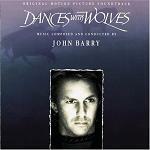 Barry's efforts also go with them – Dances With Wolves is a score for the ages and perhaps the crowning glory of a glittering career. A masterpiece. You can find this extended soundtrack CD at Amazon.co.uk in the UK, or Amazon.com in the US.